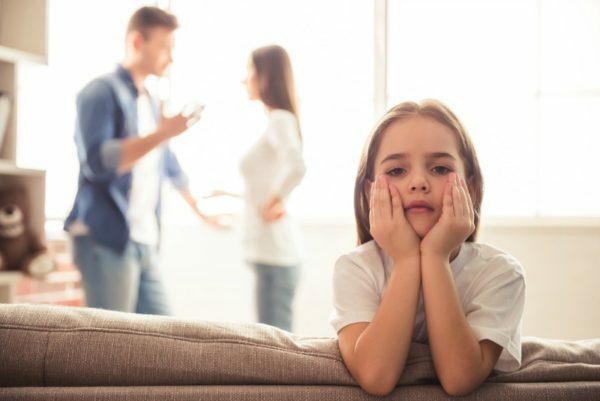 A heated exchange here, a snappy argument there … if you’re like me and have ever wondered what effect everyday fighting with your partner has on your kids then listen up because a study has just confirmed that even simple, low-level conflict between parents can cause long lasting damage to kids. My husband and I have a great relationship, but there are times where we might bicker or snap at each other because we’re so tired and worn down from the kids. Even though I know it’s common for parents to disagree and let’s face it, most couples can’t be Hallmark card worthy every single minute, I do wonder what the kids think when we have the occasional argument. Most of the time it’s easy to forget that little ears are listening. The University of Vermont has published a new study in the Journal of Social and Personal Relationships that has revealed it’s not just children from emotionally or physically abusive homes who are affected long-term by conflict, but even those who are raised in low level conflict homes can be impacted. Worrying, having a simple, everyday argument with your partner in front of your kids can cause them to become over-vigilant, anxious and go on to misinterpret neutral human interactions later in life. “The message is clear: even low-level adversity like parental conflict isn’t good for kids,” says Alice Schermerhorn, an assistant professor in the University of Vermont’s Department of Psychological Sciences and the lead author of the study. In the study, children aged between nine and 11 were split into two groups based on their assessment of the conflict between their parents. They were then asked to put a series of photographs of a couple into the categories of happy, angry and neutral. The kids who didn’t fight aced the test, while those exposed to more conflict were unable to accurately identify the neutral poses. The researchers believe the results indicate there is a high chance these children will grow up to have issues with anxiety or hyper-vigilance, or have trouble interpreting their relationships with peers, teachers and partners. The study also looked at the impact of conflict on shy children (as identified by their mothers), which revealed those with low conflict homes were unable to correctly identify the neutral poses, indicating that parents with shy children should be even more careful about arguing in front of their kids. Argue elsewhere: Whenever possible, wait until the kids are asleep or go into another room to discuss the issue quietly. Show respect: Listen to your partner’s point of view respectfully and then put yours across without resorting to swearing, yelling or putting them down in any way. Keep your emotions in check: Try not to be defensive, pass the blame, take it personally or get emotionally carried away. Take deep breaths if you need to for clarity. Take a parent timeout: If the argument is escalating then put yourselves in timeout and reschedule the discussion for another time when the kids aren’t present and you’ve both had a chance to calm down. Make sure you do deal with the issue, otherwise it will resurface again at another time. Don’t involve the kids: Never bring the kids into your argument, this is between you and your partner, not them. Be careful about the topic: Anxious kids may get really worried if they overhear an argument about money, or upset if they overhear their parents complain about a relative. Be careful about what you discuss and consider their age and lack of development in areas. Show love always: Even if you and your partner have some conflict, be sure to work through it and let your kids know how much you still love each other and them, so they don’t worry unnecessarily. I couldn’t agree more. Next time there’s a flicker of a bicker between the hubby and I, I’ll definitely be taking a different approach for the sake of my little ones. How do you handle arguments with your partner in front of the kids? Share your tips with us on Facebook.